It’s rare that one trade catches an entire sport by surprise, but when the Montreal Canadiens dealt defenseman Chris Chelios and a second-round draft choice to the Chicago Blackhawks for center Denis Savard in the summer of 1990, it sent shockwaves all throughout the NHL. Each city was caught off-guard by the sudden loss of a player that captured their heart by being an inspiration on the ice. However, the Canadiens never second-guessed themselves for trading away Chelios because they wanted to acquire a dynamic center that could put constant pressure near the opposing team’s crease. The Blackhawks front office denied turmoil with their star player, but they knew to move forward, Savard had to leave Chicago. Many experts thought the trade was an exchange of damaged goods as both players missed significant time during the season due to injuries, but Savard’s declining skills should have never garnered a player of Chelios’ caliber in return. He became nothing more than a second or third line center in his three seasons with the Canadiens. So, now the question must be asked is how could hockey’s most historic franchise make such an error in a blockbuster trade of this nature. Canadiens GM Serge Savard gave away an appealing asset like Chelios, who was coming into the prime of his career for a player that was being characterized by his coach as a problem on and off the ice. It’s hard to imagine that Chelios was a year younger than Savard because their professional careers were definitely heading in different directions. The argument begins and ends with the team owners, Molson Breweries, who were notorious for making horrible lopsided trades during their (1978-2001) ownership period. Canadien fans are still baffled and speechless over the moves that sent away perennial All-Stars Patrick Roy and Rod Langway from Montreal for virtually nothing of value in return. 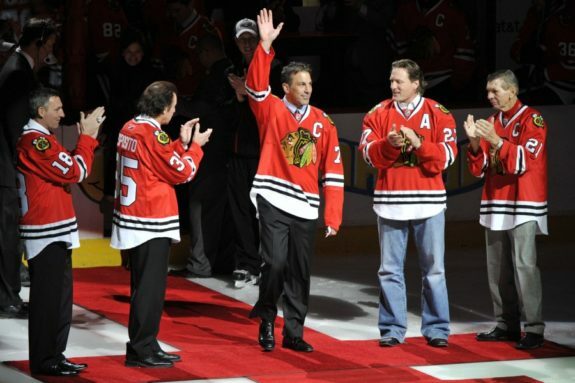 The Chelios trade to the Blackhawks was a dream come true for the young defenceman, as he was returning to play for his hometown team after enduring an injury-plagued 1989-90 season. He injured his knee in February and didn’t return to the lineup until the start of the playoffs. In his six seasons with the Canadiens, Chelios appeared in two Stanley Cup Finals (winning in 1985-86) and won the Norris Trophy in 1989. This level of production should have merited him a lengthy stay in Montreal, but that wasn’t going to the case. Team president Ronald Corey felt Chelios didn’t exhibit the type of demeanor becoming of a Canadien, so he wanted him off of the roster ASAP. Corey had concerns that his reckless off-ice lifestyle had become a detriment to the image of the franchise, and the trade to Chicago was consummated one day after Chelios was arrested for fighting with two Madison, Wisconsin police officers who were trying to detain him for urinating in public. Unexpected trades can have huge ramifications on a player’s psyche, but Chelios actually became a more complete hockey player. He made life difficult for forwards trying to put the puck in the net, and for his effort, Chelios won two more Norris Trophies (1992-93 and 1995-96) during his time with the Blackhawks. His outstanding play each season put him in the conversation as being one of the greatest defensemen to ever play in the NHL. The Blackhawks won the Chelios sweepstakes by offering a disgruntled Savard in return, who had been stifled in Mike Keenan’s aggressive forechecking style of hockey. Nagging injuries cost him 42 games over the previous two seasons in Chicago, but it was his relationship with team’s coach that sealed his fate. Savard often butted heads with Keenan during their time together, which was well-documented by the local media. The last straw for Savard was his benching during the Conference Finals, Keenan explained his decision as “a lack of effort” but he never named Savard in his postgame comments. The Wirtz Family gave Keenan the power to build his own team when they elevated him to coach-GM of the franchise. However, Savard was special because he kept the Blackhawks relevant in the NHL despite being at the bottom of standings each season. Keenan knew he had gained the upper hand in the relationship, and trading away Savard was his only chance to gain control of locker room. From the Canadiens perspective, it seemed this trade was them trying to make good on a horrible mistake they made with the first overall pick in the 1980 NHL Draft. They chose Doug Wickenheiser over local junior star, Denis Savard, who went to the Blackhawks with the third overall pick. He came into the NHL as a flashy goal scorer and became an iconic Chicago sports figure by the end of his stay. Savard scored 100 or more points five times in his career and dazzled fans with his 360 “spin-o-rama” move that often left the opposition hopeless in their own end of the ice. The Canadiens did win a Stanley Cup in Savard’s time with the team, but he was injured and did not appear in the finals against the Los Angeles Kings. It’s fitting that he ended his career where it all began, with the Chicago Blackhawks for one last farewell season.